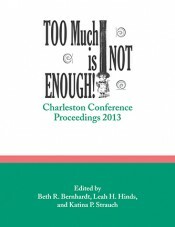 Almost one hundred presentations from the thirty-third annual Charleston Library Conference (held November 6–9, 2013) are included in this annual proceedings volume. Major themes of the meeting included open access publishing, demand-driven acquisition, the future of university presses, and data-driven decision making. 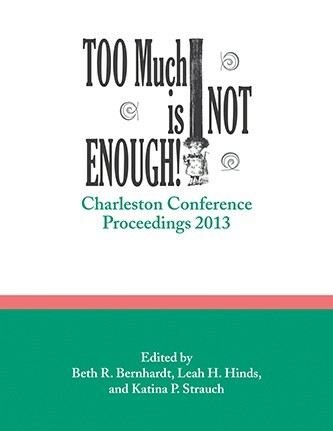 While the Charleston meeting remains a core one for acquisitions librarians in dialog with publishers and vendors, the breadth of coverage of this volume reflects the fact that this conference is now one of the major venues for leaders in the publishing and library communities to shape strategy and prepare for the future. At least 1,500 delegates attended the 2013 meeting, ranging from the staff of small public library systems to the CEOs of major corporations. This fully indexed, copyedited volume provides a rich source for the latest evidence-based research and lessons from practice in a range of information science fields. The contributors are leaders in the library, publishing, and vendor communities. Beth R. Bernhardt is Electronic Resources Librarian at the Jackson Library, University of North Carolina at Greensboro. Leah H. Hinds is Assistant Director of the Charleston Conference. Katina P. Strauch is Head of Collection Development at the Addlestone Library, College of Charleston, founder of the Charleston Conference, and editor of Against the Grain, the journal for libraries, publishers, and vendors, which is published six times a year.